I really think that cinnamon rolls are an American classic dish, but maybe I’ve been brainwashed by Cinnabon. The best test might be random interviews. 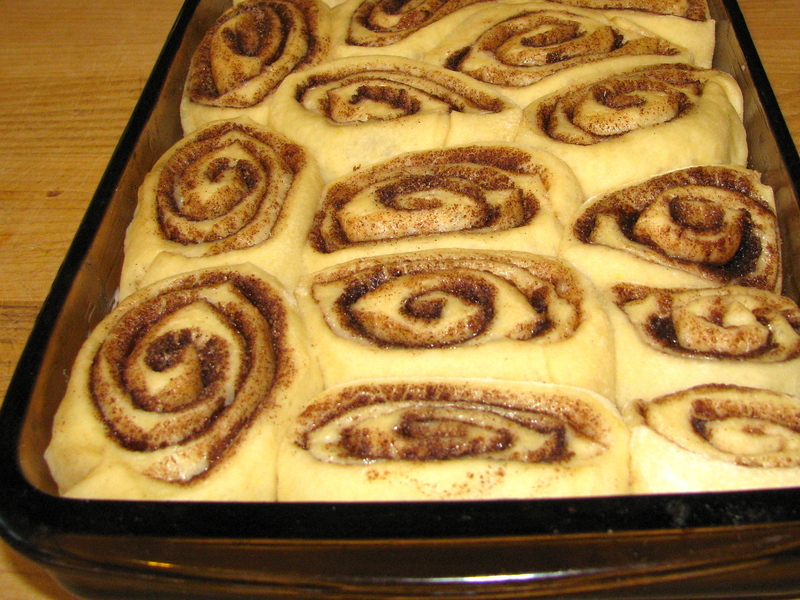 If we stopped 20 people on the street, would all of them know about and like cinnamon rolls? I thought about carrying out the experiment, but why waste the time – we know what the answers will be. As a world renown food blogger, I will put my reputation on the line and officially proclaim cinnamon rolls an American classic. Comments please. 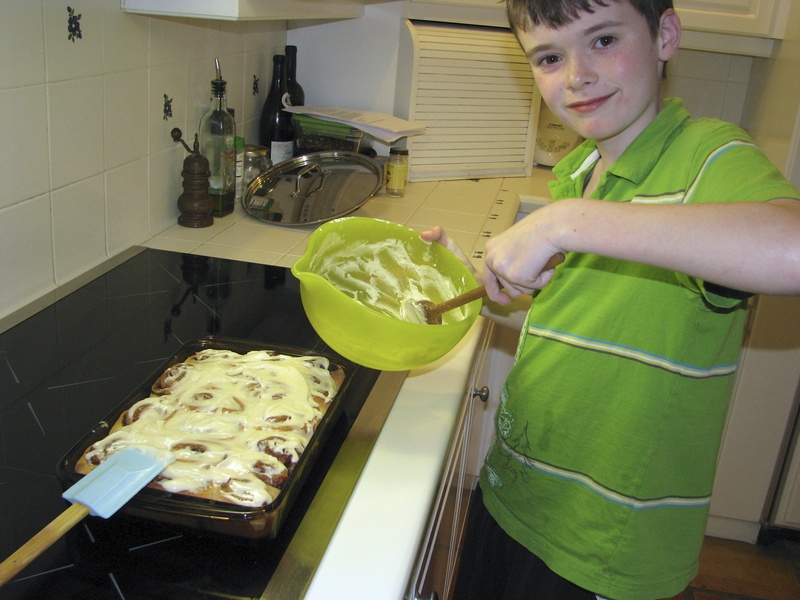 Cinnamon rolls are easy to make at home and kids love to help. You can make them as healthy or unhealthy as you want. 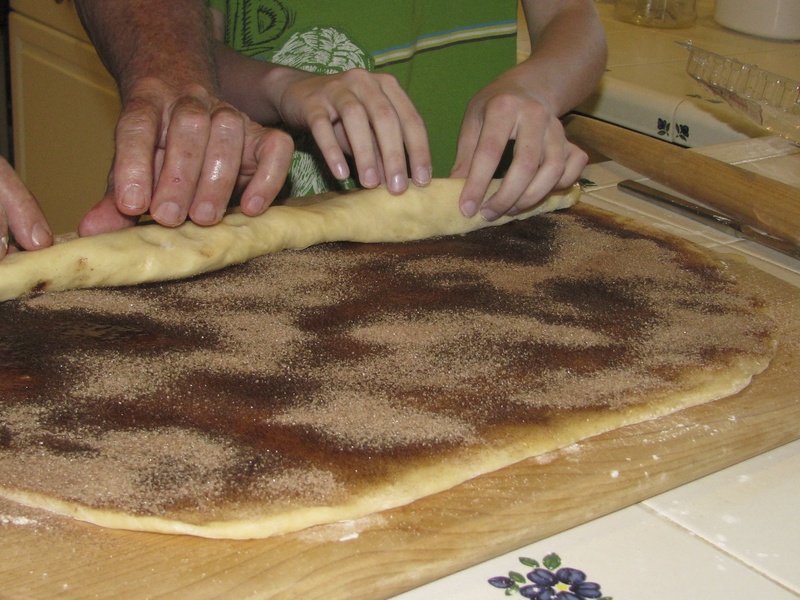 The traditional recipe is to use brown sugar and cinnamon as the filling. However, you can add raisins, nuts and even fruit to the mix. There is plenty of room for experimentation. Cinnamon comes from the bark of a small tree that grows in a number of tropical countries. The bark is cut off, rolled up and dried; ergo, the cinnamon stick. Many say that the best quality cinnamon is from the island of Sri Lanka (formerly Ceylon), which is located off the southern tip of India. (You know that you didn’t know that, so go check the map now – Map of Sri Lanka). Some think cinnamon is a magical substance. It has been used in Chinese medicine and Ayurveda (India) for thousands of years. Some studies have shown that cinnamon lowers blood sugar for those with diabetes and reduces LDL cholesterol levels. “One of the first human studies was published in 2003 in a medical journal called Diabetes Care. Sixty people with type 2 diabetes took 1, 3, or 6 grams of cinnamon in pill form daily, an amount roughly equivalent to one quarter of a teaspoon to 1 teaspoon of cinnamon. After 40 days, all 3 amounts of cinnamon reduced fasting blood glucose by 18 to 29%, triglycerides by 23 to 30%, LDL cholesterol by 7 to 27%, and total cholesterol by 12 to 26%.” However, this study, though promising, is not conclusive since it has not been replicated. 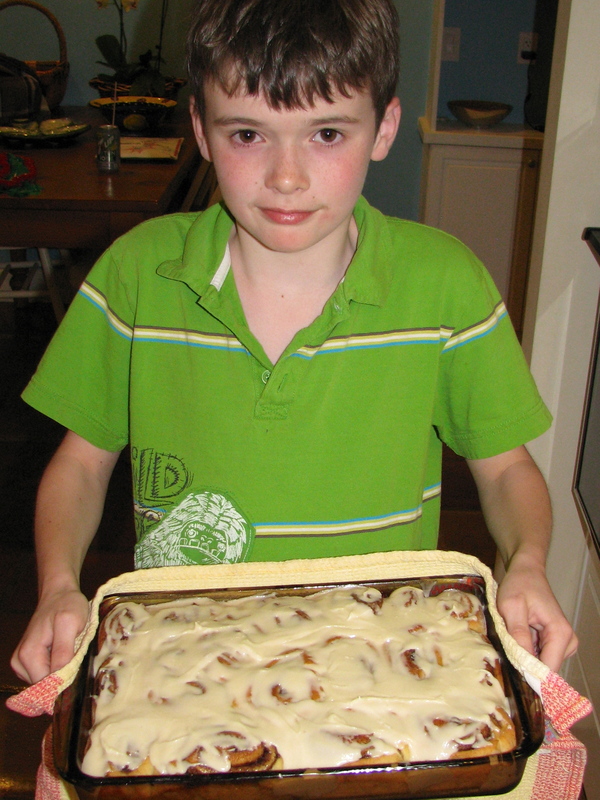 Time Required: Active prep time 45 minutes, rising and baking – about 3 hours. Add up to 1 cup of raisins, pecan, walnuts, sliced peaches or whatever turns your fancy. 1. Dissolve the yeast in 1 cup of warm milk (about 100-120 degrees). Let sit for 5 minutes. 2. Melt the butter for the dough and the filling – total 8 Tbsp. or one stick. 2. 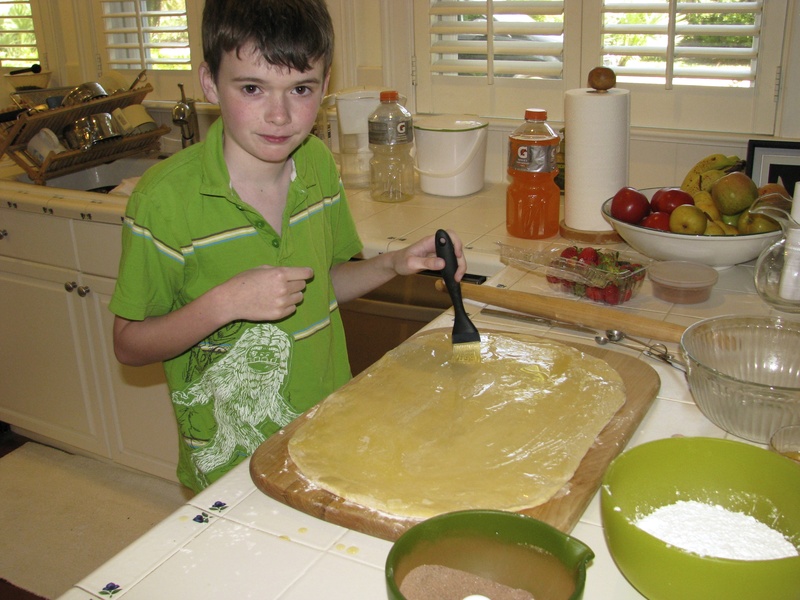 Mix flour, salt and sugar together and then stir in the milk, yeast, eggs and one-half of the melted butter. 3. Knead the dough by hand until smooth and elastic – about 5-7 minutes. 4. Put the dough in a greased bowl, cover and let rise for one and one-half hours, or until doubled in size. 5. 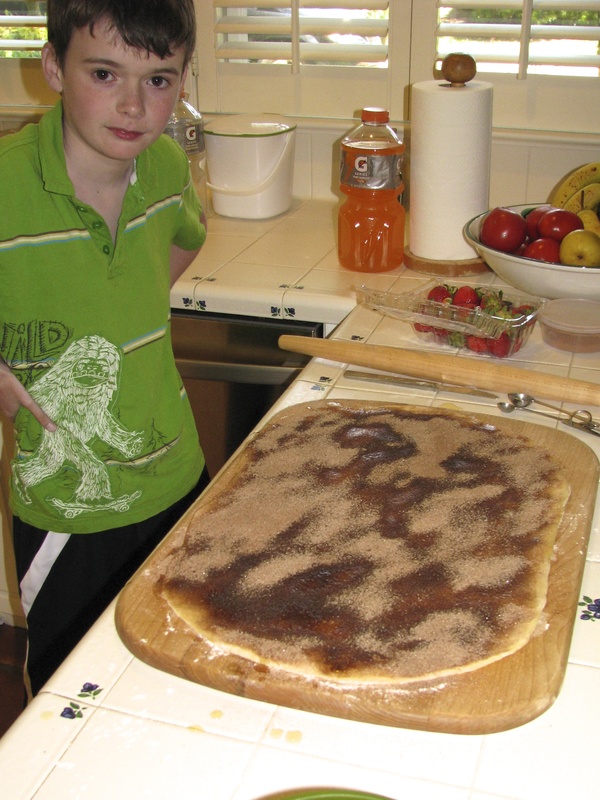 On a floured board, roll the dough into a rectangle about 12”x18”. 6. Mix the sugar and cinnamon for the filling together. 7. With a pastry brush, paint the dough with the other half of the melted butter. Sprinkle the sugar and cinnamon mixture evenly over the top. Add any other ingredients – nuts, raisins, etc. – at this time. 8. Roll up the dough starting with the long side. Pinch the dough together when you finish so it won’t come apart. Push the ends towards the middle so you have a nice cylinder. 9. 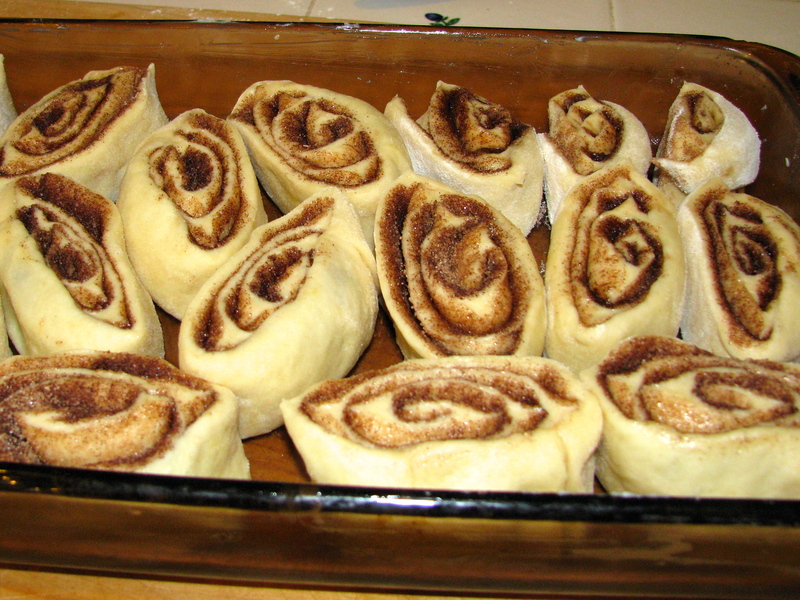 Cut the roll in one inch slices and place them, face up, in a greased baking pan with high sides. A rectangular glass dish is best. 10. Cover with plastic wrap and let rise for 45 minutes. They should get nicely crowded together. 12. Bake for 25 – 30 minutes until golden brown. 13. Mix all of the ingredients together for the glaze and spread over the hot rolls. With all of the time required to let the dough rise, it is hard to have these ready for breakfast. It seems to work best as an afternoon snack. For breakfast the following day, warm them in the regular oven (350 degrees for 10 minutes) or, even better, a toaster oven.